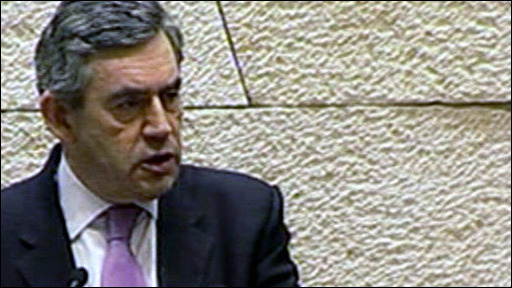 Britain is determined to prevent Iran developing nuclear arms, Gordon Brown has warned in an address to the Israeli parliament, the Knesset. He said that Iranian President Mahmoud Ahmadinejad's call for Israel "to be wiped off the map" was abhorrent. Tehran must abandon its nuclear programme or face "growing isolation". He said the UK stood ready to lead in taking firmer sanctions and was also set to vow to stand beside Israel in its "fight for liberty". Mr Brown's speech, the first speech to the Knesset by a British prime minister, marks the end of his three-day tour of the Middle East. In a message likely to go down well with his hosts, he insisted that the UK, the European Union and the United States were determined to prevent an Iranian nuclear weapon - Israel's key strategic fear. His expression of support for Israel comes a day after he and the country's prime minister, Ehud Olmert, voiced differing views over settlements in Palestinian territories. But Mr Brown, referring to his father's "lifelong affection" for Israel, said: "For the whole of my life, I have counted myself as a friend of Israel." He said the nation's achievements over the last 2,000 years, in the face of war, terror, violence, intimidation and insecurity were "indeed truly monumental" and Israel's partnership was "strong and getting stronger". "To those who question Israel's very right to exist, and threaten the lives of its citizens through terror, we say: the people of Israel have a right to live here, to live freely and to live in security," he said. "To those who are enemies of progress we say: we condemn anti-Semitism and persecution in all its forms. "To those who believe that threatening statements fall upon indifferent ears we say in one voice - it is totally abhorrent for the president of Iran to call for Israel to be wiped from the map of the world. "Our country will continue to lead, with the US and our European partners in our determination to prevent an Iranian nuclear weapons programme. "We stand ready to lead in taking firmer sanctions and will ask the whole international community to join us." Mr Brown stressed: "Iran has a clear choice to make: suspend its nuclear weapons programme and accept our offer of negotiations or face growing isolation and the collective response, not just of one nation, but of all nations round the world." In 2004, the Iranian president made a statement in which he called for an end to the Israeli state, envisaging its replacement with a Palestinian and Islamic state. He has also described the Holocaust as a myth. Liberal Democrat leader Nick Clegg said Mr Brown was "absolutely right" to condemn the Iranian president's "vile threats to Israel", but he warned: "He must come clean about his position on military action against Iran. "He must make it clear that Britain will not give its approval to a unilateral strike by Israel. "This would have devastating consequences for the region, and for our troops in Iraq and Afghanistan." Mr Brown's spokesman said that in the event of further sanctions, the focus was likely to be on Iran's energy resources. In particular, Tehran could be blocked from accessing equipment for its oil refineries. Before his Knesset speech, Mr Brown met the Israeli opposition leader Benjamin Netanyahu, Defence Minister Ehud Barak and Foreign Minister Tzipi Livni. On Sunday he criticised Israeli settlements in the West Bank, which he said caused "suffering" among Palestinians and blocked the path to peace. But he also insisted that suicide bombings and rocket attacks against Israel must end. As well as Mr Olmert, Mr Brown met Israeli President Shimon Peres, Palestinian Authority President Mahmoud Abbas and Prime Minister Salam Fayyad on his first visit to Jerusalem as premier. He also visited Jerusalem's Holocaust memorial and the Church of the Nativity in Bethlehem.